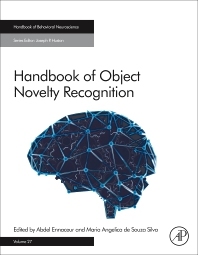 Handbook of Object Novelty Recognition, Volume 26, synthesizes the empirical and theoretical advances in the field of object recognition and memory that have occurred since the development of the spontaneous object recognition task. The book is divided into four sections, covering vision and perception of object features and attributions, definitions of concepts that are associated with object recognition, the influence of brain lesions and drugs on various memory functions and processes, and models of neuropsychiatric disorders based on spontaneous object recognition tasks. A final section covers genetic and developmental studies and gender and hormone studies. Outstanding piece of work edited by the inventor of the original spontaneous memory test now finally named grammatically correct: "Object novelty recognition"
Dr Abdelkader Ennaceur is a Senior Lecturer in Therapeutics in the Department of Pharmacy, Health and Well-being at the University of Sunderland. His research focuses on the brain structures and neurochemical systems that underlie learning and memory, and emotion. He has developed a number of behavioral tasks for rodents that assess anxiety, learning, and memory, and these behavioral tasks form the basis of his current research projects. He has authored nearly 40 scholarly publications and in 2013 was guest editor of 25 Years of Object Recognition, a special issue of Behavioural Brain Research. Dr. Maria de Souza Silva is deputy director of the Center for Behavioral Neuroscience at the University of Dusseldorf. Her research investigates learning and memory processes with different behavioral paradigms and the characterization of their neurochemical mechanisms, especially the cholinergic system of the basal forebrain. The focus of this work is on the investigation of the role of neurokinin receptors (NK1, NK2 and NK3) in rodents and their involvement in aging-associated deficits. In parallel, she also investigates the development of new animal models of learning/memory and the investigation of alternative ways of drug administration for targeting the brain. She is the author of nearly 100 scholarly publications.